Round signet style ring with a Jolly Roger symbol on the top. The top is 19.6 mm wide x 19.6 mm high and the shank tapers down to 5.7 mm in the back. Sterling silver. Limited edition of 20. 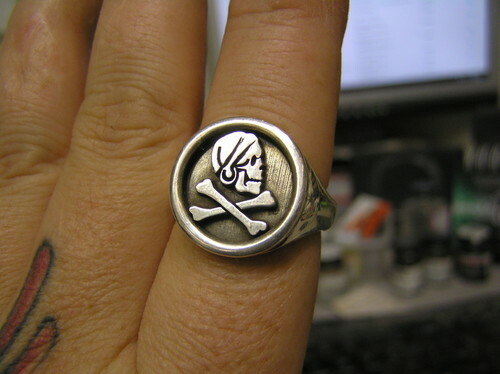 Design Notes: The Jolly Roger (pirate symbol)bon this ring is that of Henry Every an English pirate from the 1690's.